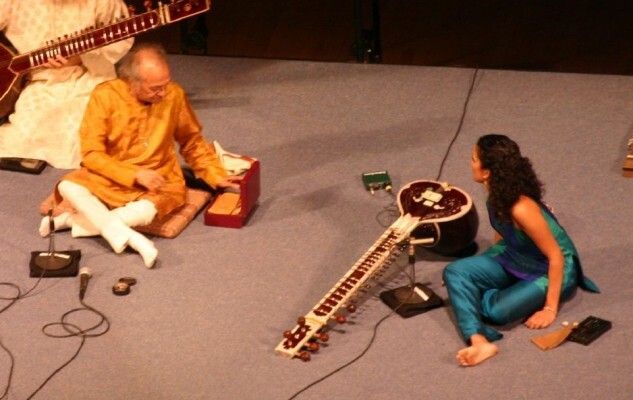 A Peek Into Transcendence with Anoushka Shankar at The Grammy Museum - TheUrbanMusicScene.com | Music Reviews! This night was a rare, intimate, up-close evening with world music royalty shared by an audience split almost evenly between Anoushka’s family (including her son, mother…and Mom’s dog), the local Indian community as well as fans of every hue. In the short time allotted, much was shared and much was learned. Breaking from typical Grammy Museum order, Ms. Shankar performed first with the interview following. Having just had her personal walk through of her world famous father’s exhibit of artifacts, stage wear, documents and audio/video clips, she was understandably emotionally fragile. Touched by seeing the intimate detail of her father’s personal stage “set up” (items he kept within reach like reminder notes and emollients for his fingertips), she spoke aloud that she needed a minute before beginning to play. In the first of many touching, down to earth moments, she called her first son Zubin to come up for a hug. She then began “Raga Jogeshwari,” a composition of her father’s that she played alone. Serene and meditative, the song illuminated her lineage to her father and her oneness with the instrument she’s been playing since she was 7 years-old. The final selection – a medley – introduced the remaining three members of her ensemble who sat patiently in position with her on the stage floor through the entire program until their time to play: Sanjeev Shankar on a thin wind instrument called a shehnai, Kenji Ota on a small stringed instrument held upright called a treble tanpura, and Rahul playing the deeper-toned bass tanpura. The medley built slowly, each instrument joining in to a dynamic finish, eliciting a standing ovation. Regarding father Ravi, Anoushka shared that the relationship he shared with Beatles guitarist George Harrison was very close (she referred to him as “Uncle George”). In the exhibit, it was noted that, among other things, Ravi democratized the performing stage by having the percussionists sit at the front alongside him instead of India’s tradition of having them play behind. Anoushka adopts this as well. However, without speaking for her father, she intuited that though Ravi enjoyed exposing his music to large audiences when Indian music became a rock festival fad in the late `60s to mid-`70s, he ultimately longed for audiences to fully embrace Indian classical music in its purest state. Born in London, raised between Delhi and Encinitas, California (near San Diego), and currently residing back in England with her husband and two sons, Anoushka was also in Los Angeles promoting her new CD; Land of Gold (released April 1 on Deutsche Grammophon) .Where her past recordings were more personal and internally inspired, this album is a very externally derived response to the current refugee crisis. Anoushka feels that though she may not fully understand the intricacies of the political policies regarding this situation, she has a voice and an art form through which she can protest what she feels is an injustice to humanity. In addition to inviting her mother, Sukanya Shankar, up to extend her gratitude to the museum (and some delightful maternal jabs at her daughter whom she called “monkey”) then basking in some praise and questions from audience members, Anoushka closed out speaking on inspiration from other art forms. More than any other, she is drawn to the art of dance in all forms yet, musically, she one day would love to collaborate with Icelandic pop goddess Björk. She enjoys music across the spectrum, some of which she believes fans might find truly surprising. As always, this writer encourages music lovers the world over when in Los Angeles to visit the Grammy Museum. Beyond the exhibits, you can also watch video of the entire Anoushka Shankar program detailed above along with hundreds of other priceless evenings of music and conversation.